I am a scholar of art and religion. I also am an artist who dabbles in everything from painting to photography to mixed media. The daughter of a professor father and an artist mother, I split my time growing up between Claremont, California and summers on the relatively unpopulated island of Molokai, Hawai’i. 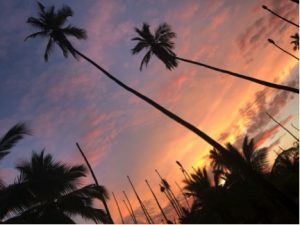 My parents were keen on detaching from the frenetic energy of Los Angeles for the more peaceful and restorative pace of Molokai, where my father would catch up on his reading and draft many articles while my mother painted. My mom has been living full time on Molokai since 1994. While I have seen her nearly every year, it has been thanks to her visits to me on the East Coast where I now reside. Last summer I was able to visit her on Molokai. It was my longest interval away, nearly nine years. Prior to that, I don’t think more than three years had ever passed without my return. I really craved the island homecoming. I needed to be in its sphere of presence: the way time slows down, and focus becomes so magnified on simply what is before you. Mindfulness is of the island’s essence. And I always feel closest to God when I am there. There is no doubt that Molokai is and always has been considered a very special place in this regard. It is still known as Molokai Pule O’o: Island of Powerful Prayers. In ancient times, Molokai had the reputation of thwarting invasion by uniting Molokai’s people in prayer. And Molokai was the training ground for the most powerful priests in the islands. It is also the birthplace of hula, the Hawaiian narrative dance form replete with deep emotion and spirit in action. Mindfulness is of the island’s essence. And I always feel closest to God when I am there. 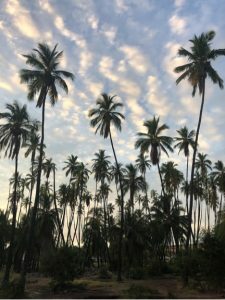 One of the most special places on Molokai is the historic Royal Kapuāiwa Coconut Grove. It is named after King Kamehameha V (Lot Kapuāiwa). In the 1860s, he planted 1000 coconut trees along the 10-acre beachfront, one to represent each warrior in his army. The grove is considered sacred. It not only requires spiritual respect and care, but also physical maintenance. Palm trees only live 60-80 years, so the trees need cyclical replanting. Though some original palms are still standing, it is estimated that more than half of the grove has been replanted, some at least three times. 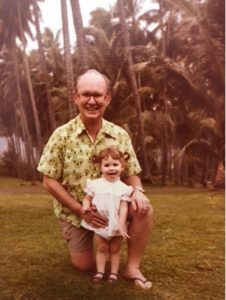 Author and her father at the Coconut Grove, circa 1978. On most of my visits to Molokai, I have gone to the grove. There is something cyclical about it as a point of reference for me. 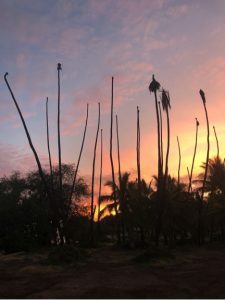 Many times in my life I have quietly walked in its vicinity with a certain reverence of wonder, measuring myself against the tall palms, reflecting upon my physical and spiritual growth since the last time I was there. Shortly before my departure last summer I found a photo of my late father and me there. I planned to spend some meditative time behind the camera, stretching both time and beauty by practicing some contemplative photography at the grove. 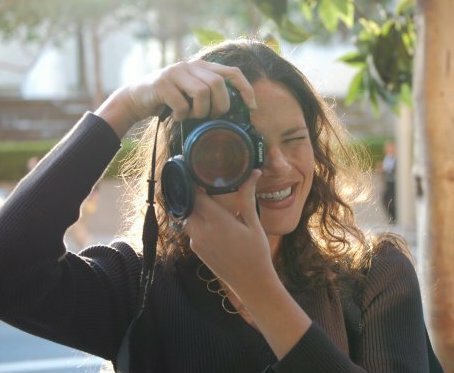 The famed humanist photographer, Henri Cartier-Bresson, described photography as “putting one’s head, one’s eye, and one’s heart on the same axis.” For me, contemplative photography is a tool for mindfulness, helping me align mind, eye, and heart. Her use of the Hawaiian pidgin slang for bald-headed, bolo-head, helped me identify part of our angst in seeing those wounded trees. On some subconscious level we were both recalling the recent trauma of her chemotherapy treatments. 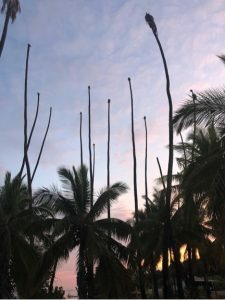 The gorgeous royal manes of the coconut trees were stripped away. Their glorious profiles had become so disfigured. If they once represented a strong and sacred army that warned others of invasion, they barely stood upright now, weakened and diseased, reminders of our own vulnerability. They were a reminder of how closely she brushed up against mortality, escaping it so narrowly. Due to a lack of resources, over the years the grove has not been tended to. There have been invasions of coconut mites, white flies, pests, coconut scale, and also suspected is some type of fungus. Even human impact has been a great detriment to the grove. Still, I decided to go to the grove to seek out my moment of deeper connection through my camera. I felt in some ways as if I was visiting a terminally ill loved one. There was a heaviness to this return that was unlike the more joyful homecomings to the grove of years past. I admit, in my shallowness, I decided to go closer to sunset, hoping that the beautiful colors of the sky would offset the ugliness of the diseased trees that would inevitably be in the photos. At first, I even tried to crop them out of my shots to the best of my ability. And then, perhaps it was the fullness of the connection that filled my spirit, I realized that rather than push away the subject of that woundedness, I would embrace it. I turned my camera directly toward it. I stared it in the face and really saw it. I was present with it, as uncomfortable as it was. Isn’t woundedness a more relatable condition among humanity? The Tibetan Buddhist Chogyam Trungpa once said “Artistic vision comes from a mind clear enough to fall in love with what we see.” And indeed some of my favorite photos from that sunset evening of contemplative photography were not the ones that cropped out the wounded palms, or focused entirely on them, but the ones that held them in balance. The photographs with both the healthy trees and the diseased trees remind me that there are times in life when we flourish and thrive and others when we languish and decline. In fact, isn’t woundedness a more relatable condition among humanity? I wondered about the invisible root systems of these trees and what anchored them. Ironically, when my mother’s physical health was so poor, her roots of faith were never stronger. Paradoxically, a tree can seem healthy to the eye, but if it has root rot, there is virtually no saving it. What a powerful metaphor for the vital role of faith. Let us not shy away from that which we initially find ugly or deem to be unfit. Perhaps it is a matter of waiting for our mind, eye, and heart to align. For me these bolo-headcoconut trees served as strong reminders to appreciate the beauty and preciousness of life, to be physical and spiritual stewards of the environment and ourselves, and to take stock of those “vitals.” These were lessons learned from Molokai Pule O’o, but when we bring mindfulness to our environment isn’t every place indeed capable of being a land of healing, powerful prayer? Featured Image: Patrick McNally, “Kawela Beach Park Molokai Hawaii (Maui County)” (April 19, 2006). CC 2.0 license. Article images by Jenny Patten LaMonica. Used by permission.